On November 2, Charge d'Affaires a.i. 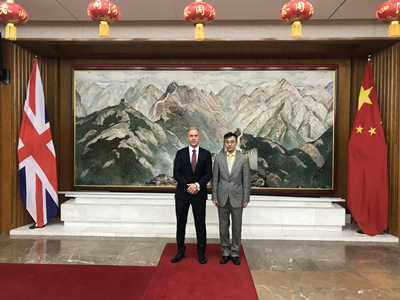 Zhu Qin met with Michael Lawrence, Chief Executive of Asia House at the Chinese Embassy. Zhu noted that this year marks the 40th anniversary of China’s reform and opening up and the 5th anniversary of the Belt and Road Initiative (BRI). The Reform and opening up have not only created a development miracle in China, but also brought tremendous opportunities to the world. The BRI, a major measure for China to follow the trend of the times and further expand its opening up, has created a new platform for a new round of economic globalization. Zhu hoped that Asia House, an important think tank on China and Asian affairs, would continue paying attention to China’s development and generating productive ideas for China-UK Belt and Road cooperation. Lawrence said that China's achievements in reform and opening up are admirable. The BRI has provided new ideas for promoting world development and improving global governance. The UK advocates free trade and encourages opening up to the outside world. It is an important partner of the BRI cooperation. Asia House stands ready to help the world understand China and promote business cooperation between China and the UK. The two sides also exchanged views on Brexit, China-US trade dispute and international economic governance.